If you tire easily of the overdone, overproduced contemporary blues - the garbage that sounds like plastic instruments being played in a tin box - and if you've ever wondered why that stuff is even filed under blues, than you're like Jimmie Lee Robinson. To Jimmie Lee, the blues are more than just fast notes and wild guitar solos. They are about feelings deep and personal. They punch at emotions. With All My Life, his second APO Records release, Jimmie Lee is aiming for goose bumps and tears. And if you've got appreciation for acoustic, front porch blues, you'll have a tough time escaping his spell. 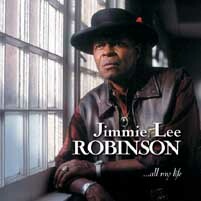 No doubt Jimmie Lee Robinson offers a delightful taste of traditional blues. His work through the years with such stalwarts as Little Walter, Howlin' Wolf, Freddie King, Elmore James and Jimmy Reed have made their impressions on the man called The Lonely Traveler just as he has been credited with inspiring them. On All My Life you'll hear standby classics like a haunting, slowed-down version of Muddy Waters' Forty Days and Forty Nights with eerie harmonica accompaniment by Madison Slim. And Jimmie Lee even covers a non-blues favorite with What a Wonderful World. His live version of that song at a 1999 concert in Blue Heaven Studios - the converted church that is home to APO Records - brought tears to scores of the 400 in attendance. But All My Life is also packed with Jimmie Lee originals like the title track, which was once covered by John Mayall, where Jimmie Lee pleads with the woman of his dreams to return all the respect and love he's paid to her. That track is also a perfect showcase for the classic Jimmie Lee growling vocals and the spurs jangling from his boots as the only percussion. Unlike his first APO release, Remember Me, an almost entirely-solo effort, Jimmie Lee is joined on most of the All My Life tracks by APO artist and noted-guitarist Jimmy D. Lane and journeyman harp player Madison Slim, whose knack for acoustic blues is highlighted on this release. Jimmie Lee has gained national attention for his protest of the destruction of Chicago's famed Maxwell Street, said to be the birthplace of Chicago blues and the neighborhood where Jimmie Lee grew up. He fasted for 81 straight days, shunning solid food as if it was the wrecking ball he so badly wants to stop. His efforts were even documented on the front page of the New York Times. It's obvious Jimmie Lee takes things seriously. The same goes with his blues. He's likely been that way all his life. "All My Life is a worthy tribute to the Chicago Maxwell Street tradition of rhythm and blues. It's a stand up front porch acoustic style that has Robinson's spurs jangling in time with the beat, his humming of the tune between lyrics and generally beguiling the listener with every bold and richly coloured improvisation...this superbly recorded Chicago blues just eats you up inside." Awesome Recording With A Great Performance by Jimmie Lee Robinson. A Total Must Have For Vinyl Lovers.